We’ve been working on this one for a while. Maxime and I are really pleased to release a new addition to the FeedPress analytics dashboard. There are several metrics that you’ve grown accustomed to over the years: RSS subscribers, podcast downloads, link/open tracking. Well, it’s time we added a new and useful component: geolocation. 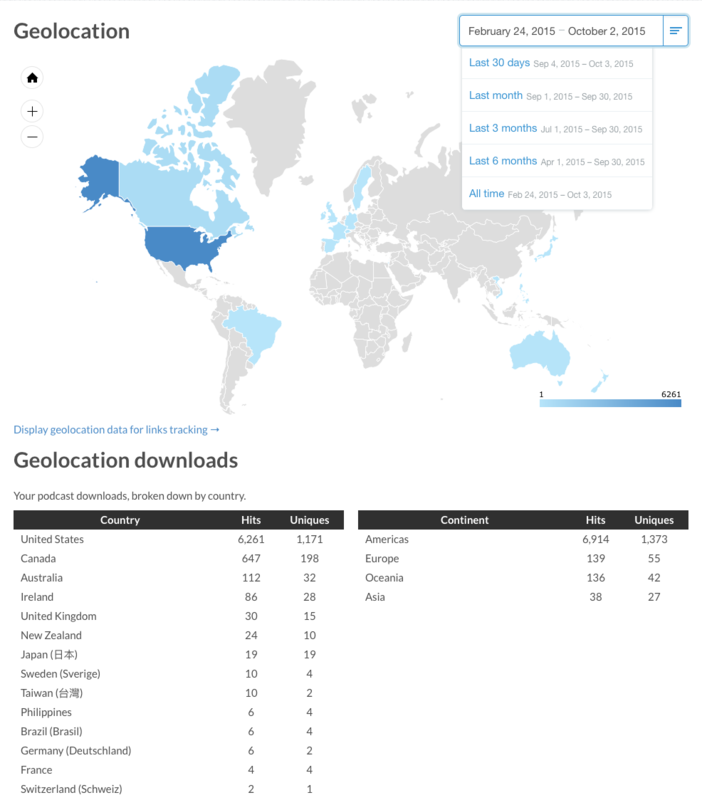 Today when you login to your FeedPress account, under Statistics > Geolocation, whether you have a standard or podcast enabled feed, you will be able to see where your subscribers or downloads are coming from. There’s no need to configure anything. Geolocation data is available for tracked links as well. We’ve been using it internally for a few months with our own personal blogs and podcasts and we’ve really enjoyed seeing this data. We could have stopped there, but we couldn’t help ourselves. In the the image below, you’ll see we fiddled with our calendar picker. Previously, you could only select a date in the past, which we weren’t satisfied with. You asked and we listened–the date picker has been completely redesigned. In addition to a visual redesign that’s more pleasing, there are now presets for last 30, last month, last 3 months, 60 and 90 days, and even all-time. Presets are a quick and useful way to access recent data, but you may want to select your own custom date range. With our new date picker, you can now select ranges. This is far more useful and robust than the previous iteration and we think you’re going to enjoy it. If you have any feedback, I’d love to hear from you.